Not a runner but want to be a part of our 5K race? Volunteers are needed during setup, along the course, at registration, helping with water/food at the finish line, distributing medals, and during cleanup. 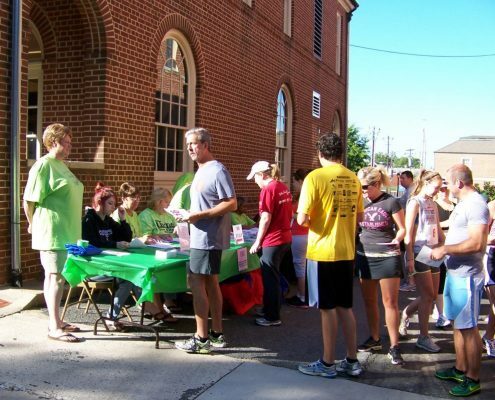 Volunteers make the 5K safe and fun for the runners. Fill out our volunteer form below or email us at the N.C. Music Hall of Fame Museum: [email protected] You will be contacted prior to the event with your specific assignment and detailed instructions. If you have any questions about the positions available feel free to give us a call: (704) 934-2320. Must be dependable, friendly and have a good attitude. Must be able to work outdoors in any type of weather condition. Must be able to follow instructions and be ON TIME for your position! Volunteers will be needed to assist the Kannapolis police department in keeping runners safe while crossing intersections. Volunteers must be available to stay at their post for the entirety of the race. If you are a little bossy, enjoying being a ‘go to person’ and in a leadership role, we are looking for some talented and experienced volunteers to assist in several key areas on race day! We discourage children under the age of 15 from volunteering without a parent for this event. It is important that you let us know if you become unable to volunteer in advance, so that we can designate a new volunteer in your place. Looking to help the cause? Use this section for any special notes or comment such as you are participating as a member of a group or organization, etc. IN CONSIDERATION of the acceptance of my application and the permission to participate as a volunteer in the Rhythm & Run 5K ("the event"), I, for myself, my heirs, executors, administrators, successors and assigns, HEREBY RELEASE, WAIVE AND FOREVER DISCHARGE, North Carolina Music Hall of Fame, all sponsors, volunteers, contributors, contractors, employees, sanctioning bodies ("the aforesaid") OF AND FROM ANY AND ALL claims, demands, damages, costs, expenses, actions and causes of action, whether in law or equity, in respect of death, injury, loss or damage to my person or property HOWEVER CAUSED, arising or to arise by reason of my participation in the event as a volunteer, or otherwise, whether prior to, during or subsequent to the event, AND NOTWITHSTANDING THAT THE SAME MAY HAVE BEEN CONTRIBUTED TO, OR OCCASIONED BY, THE NEGLIGENCE OF ANY OF THE AFORESAID. I further hereby agree to HOLD AND SAVE HARMLESS and AGREE TO INDEMNIFY all of the aforesaid from and against any and all liability incurred by any and all of them as a result of, or in any way connected with, my participation in the event. I hereby authorize any first aid, medication, medical treatment, or surgery deemed necessary in case of emergency. I also authorize the attending medical person to execute on my behalf any permission forms and other appropriate medical documents on my behalf if I am not immediately available to do so. I understand that I am responsible for any charges incurred by me or on my behalf for medical treatment. I WARRANT that I am physically fit to serve as a volunteer. I hereby further agree that my failure to sign the volunteer waiver will mean I will not be allowed to participate in the Rhythm & Run 5K. I approve the use of any photos of myself taken at this event for use in promotional materials and advertising by the North Carolina Music Hall of Fame and host organizations. BY CHECKING THE "I AGREE" BOX BELOW THIS WAIVER, I ACKNOWLEDGE HAVING READ, UNDERSTOOD AND AGREED TO THE ABOVE WAIVER, RELEASE AND INDEMNITY.